Beautifully engraved certificate from the dot com Entertainment Group . This historic document was printed by the Caribbean Security Company and has an ornate border around it. This item is hand signed by the Company's President and Secretary. The dot com Entertainment Group is a leading software development company specializing in the creation and support of Internet gaming products and related services, which neither operates nor participates in its customers' on-line gaming sites. As one of the first companies to develop and license, through its Barbadian affiliate Parlay Entertainment Limited, multi-player, pay-for-play bingo technology on the Internet, DCEG is a leader in the on-line bingo market, and also offers a comprehensive suite of Java and Flash-based casino and lottery products. 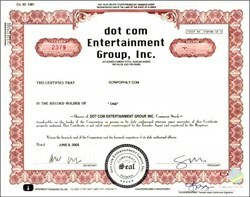 dot com Entertainment Group is committed to customer satisfaction and the regulatory compliance of its entertainment software products worldwide.